Il bosco di Porporana, oggi, primo giorno di Primavera, e' un'unica fascia di limo. Mi muovo in uno spessore di alberi, ferme le colline di cartapesta di rami intrecciati, seccati nel limo. Non e' un bosco, e' un bosco in un sogno e potrei trovare un modellino di casa lasciata dal Po invernale. Capisco gli animali, che dalle campagne passano ed attendono le prime piogge a restituire i colori e finalmente le lucciole a Giugno ad illuminarli. Strana sensazione, esco al sole, qui dove il bosco esce all'argine, l'erba e le viole e la vista della campagna. Selection of the right plants for the specific site. Real structural plants marked down into the Planting Plan. The other plants put randomly into the matrix: No. of plants per msq of the grid, randomly intermingling (even tall plants). Succession through the year. High planting density. Close planting allows the plants to quickly form a covering to shade out weeds. 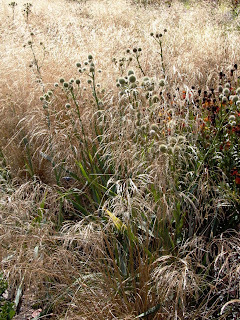 Use perennials and grasses creating planting specifications that can be placed almost randomly. Matrix: layers (successional planting for seasonal interest) of vegetation that make up un intermingling (random-scattering) planting scheme: below the surface, the mat forming plants happy in semi-shade, and the layer of sun-loving perennials. Plants are placed completely randomly: planting individual plants, groups of two, or grouping plants to give the impression of their having dispersed naturally. Even more with the use of individual emergent plants (singletons) that do not self-seed, dispersed through the planting. An intricate matrix of small plants underscores simple combinations of larger perennials placed randomly in twos or threes giving the illusion of having seeded from a larger group. The dispersion effect is maintained and enhanced by the natural rhythm of the grasses that give consistency to the design. They flow round the garden while the taller perennials form visual anchors. Allow self-seeding (dynamism) using a competitive static plant to prevent self-seeders from taking over: Aruncus to control self-seeding Angelica. Sustainable plant communities based on selection (plants chosen for their suitability to the soil conditions and matched for their competitiveness) and proportions (balance ephemeral plants with static forms and combinations such as clumpforming perennials that do not need dividing: 20% ephemeral, self-seeding plants, 80% static plants) of the different species, dependent on their flowering season (a smaller numbers of early-flowering perennials, from woodland edges, which will emerge to give a carpet of green in the spring and will be happy in semi-shade later in the year, followed by a larger proportion of the taller-growing perennials which keep their form and seed-heads into the autumn and the winter). Year-round interest and a naturalistic intermingling of plant forms. Ecological compatibility in terms of plants suitability to the site and plants competitive ability to mach each other. Working with seed mixes and randomly planted mixtures. Perennials laid out in clumps and Stipa tenuissima dotted in the gaps. Over the time the grass forms drifts around the more static perennials and shrublike planting while the verbascum and kniphofia disperse naturally throughout the steppe. Accents: Select strong, long lasting vertical forms with a good winter seed-heads. Select plants that will not self-seed, unless a natural dispersion model is required. Planes: if designing a monoculture or with a limited palette, more competitive plants may be selected to prevent seeding of other plants into the group. 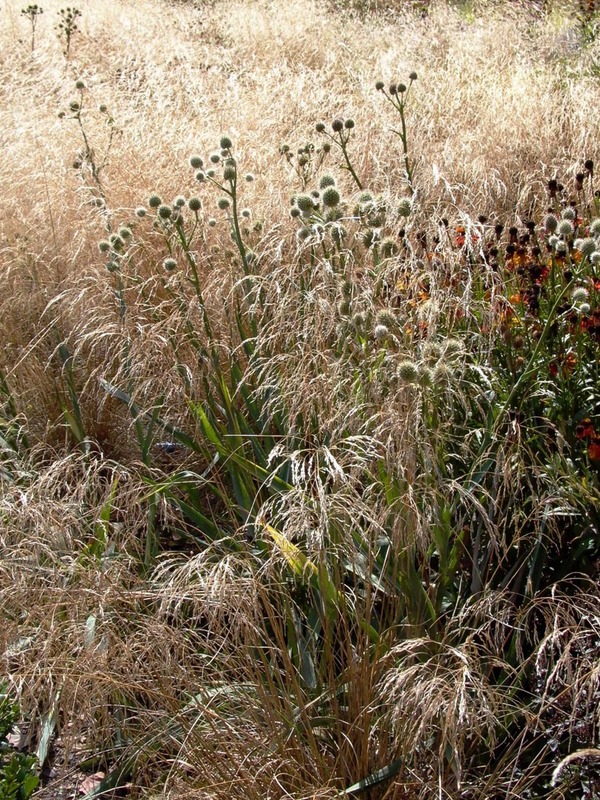 Drifts: to create drifts of naturalistic planting that are static in their shape over time use not-naturalizing, not self-seeding, not running plants. Create naturalistic blocks for the seeding plants to drift around. For the static forms select plants that do not allow the ephemerals to seed into them. Blocks: use not-naturalizing species, in high densities, in large groups. Select compatible plants of similar competitiveness to allow for high-density planting (to enable planting at high density in small gardens). Achieve rhythm by repeating colours and forms over a large-scale planting. A visit to North Rhine-Westphalia gardens with my friend Wolfgang Rembierz. Industrial areas transformed in wonderful parks, the countriside and its children's plays, woods, and horses bathing in the sun along the river... What is the difference beetwin the gardens of this region and the Italian ones? Why is it so difficult for us, Italians, to allow Nature to kindly outcompete the historically rooted point of view about form, about the color green, in one word, about gardens? The EGHN next magazine will host this paper, this spring: "The second edition of the EGHN-Magazine is likely to be published in April 2017. The thematic focus will be on “art and culture in parks and gardens”. The “View from abroad” on North Rhine-Westphalia will be written by an Italian landscape architect." The first step into a new project, a wood called Claudio Abbado to be planted in Ferrara, my town, has been disclosed to the public. You may want to read (in Italian) a first article, a second one, and a third one. The European Project Hybrid Parks ended with a Final Report. You may want to have a look at its pages and if you bump into the Epilogue you might recognize my writing hand. You may also want to read the two writings for the conferences in Ferrara, Italy 11-2013 and Cologne, Germany 10-2014 in the Publications section of this blog. Published via Blurb you may want to have a look at the preview of the new born Manfredi's garden, a small book collecting 16 posts from the "20 Diaries +" the English section of this blog. "Dream plants for the Natural Garden"
"Planting in Time and Space"
"A year in the life of an English Meadow"